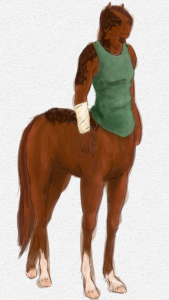 Safelor is a centaur matriarch, acting as leader and guide to her herd. 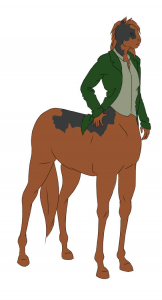 While centaur herds are traditionally made up of a few extended family groups, Safelor has a history of adopting people who she feels needs her protection, regardless of blood relation – or race. 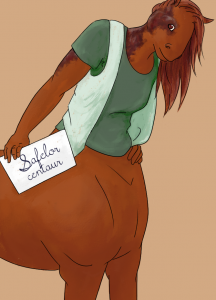 Unlike Garros, Safelor’s appearance has been fairly consistent since her initial conception – a chestnut mare dressed in green. The dark pattern across her face and back is a burn scar from when the Baker’s Lane community home burned down. The bandage and sling on her arm are from injuries sustained in the opening scenes of the game. I love the little ear-twitch in the animation! Very cool stuff. 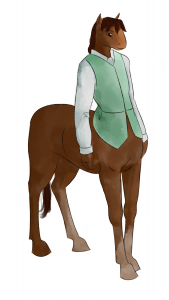 Thanks 😀 Putting in nose twitches and tail flicks is one of my favourite thing about animating characters.